Thank you for registering with Mannys Fitness Program where your results are Guaranteed! Please remember to bring proper workout gear, proper running shoes, gloves (optional) and water to drink. We look forward to seeing you part of the program. Always and forever Mind, Body & Strive! *Please enter all of the required fields. *An Email regarding your spot reservation and all other additional information will be emailed to this email address. Please be sure it's a correct and working email address. If nothing is received please call and contact us directly. Check your junk or spam folder if the confirmation email doesn’t show up in your inbox. Please choose which Boot Camp Schedule and Location you would like to attend. Do you know anyone who would be interested in our program? NOTICE: It is wise to seek your doctors advice before beginning any health/fitness/nutrition program. This release is entered into between the undersigned and Mannys Fitness Program. 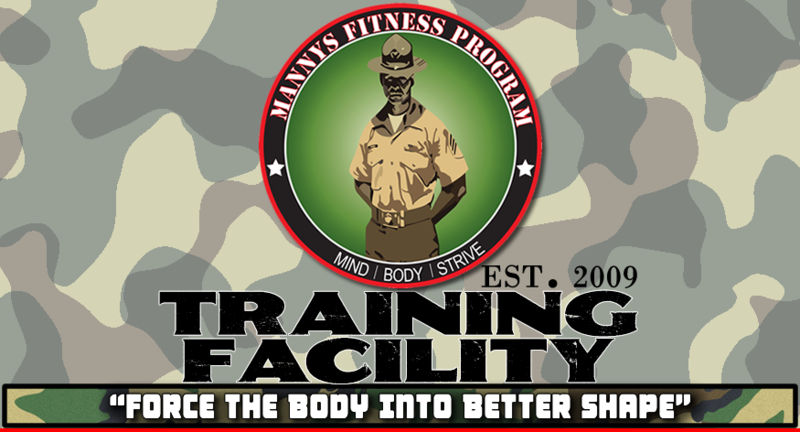 The purpose of Mannys Fitness Program is to provide fitness instruction, motivation and coaching for any individual fitness level. 1. Acknowledges that Mannys Fitness Program is not a licensed physician and is not trained in any way to provide medical diagnosis, medical treatment or any other type of medical advice, only recommendations. 2. Acknowledges that coaching/training is another tool for teaching athletes/individuals about themselves but that Mannys Fitness Program does not guarantee neither good nor bad will occur nor guarantees the training advice given by Mannys Fitness Program will produce good nor bad results. 3. Acknowledges that the undersigned has been told if they feel tired feel pain or feel out of the ordinary in any way either related to your training or otherwise that the undersigned should contact a physician at once. 4. Acknowledges that boot camps, weight training, obstacle courses and any other related sports are an extreme test of one's mental and physical limits and carry with it potential for damage or loss of property serious injury and death. That the undersigned assumes the risks of participating in these types of events/activities including the inherent dangers of the natural elements that they are fit and they have a regular medical physician they can contact regarding any medical problems that they might develop. The undersigned expressly waive release discharge and agree not to sue from any liability of death disability personal injury or action of any kind and Mannys Fitness Program for the undersigned participating in said sporting events and/or training for said sporting events. The Undersigned agrees that this is the full agreement between the parties that Mannys Fitness Program nor anyone else has not verbally contradicted any of the terms of this release and that the undersigned has entered into this agreement free and voluntarily without force or coercion. I agree that if I am taking advantage of MFP Boot Camp that I must attend all training days for which I am registered unless excused in a timely manner. I understand that photos or video may be taken during the course of my involvement in Boot Camp which may be used for promotional purposes. I understand there is no refund policy. By signing up for camp I am making a commitment to myself. I am committed to a fit and healthy lifestyle. I understand that MFP Boot Camp will accept no excuses for my failure to fulfill my commitment. I understand that by submitting my registration all information will be filed systematically and any cancellation will result in a $20 system rejection fee. Please read our Registration Policy. This is a legal electronic contract therefore legal actions are activated upon submission. Payments can be made before or at our first training day location. Please see our Payment Options.